This year has flown by SO quickly! It always amazes me now that I’m well into adulthood just how fast each year flies by. It makes me want ensure that my kids have as many wonderful childhood memories as possible. 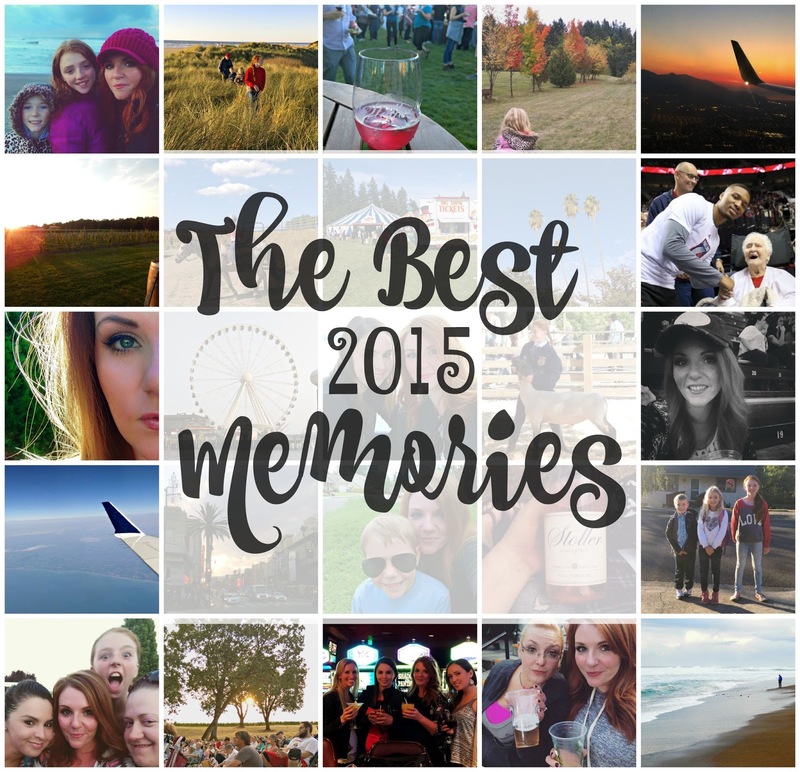 Last year I reflected back on the year and did a round up of my favorite moments, and I wanted to go back and do the same thing this year and some of my personal best memories. It was hard for me to narrow it down because I have many fond memories with my children, but mostly I wanted to highlight things that I wrote and shared with on here. 2015 was definitely the year that I fell in love with Broadway performances. I was initially contacted by their media to review the performances, and I couldn’t resist the opportunity. The first performance I saw was Cinderella with Emma and it was one of my favorites. Throughout the year I had the opportunity to take family and friends with me to see Wicked, I LOVE LUCY, The Phantom of the Opera, Beauty and the Beast and several more. In February Wayne and I stayed the night in downtown Portland and this trip was so special mainly because of the outstanding dinner at the Ringside steakhouse, where I feasted like a queen. It was one of the only times the two of us stayed overnight solo this year. I booked a long weekend getaway south of Lincoln City where we stayed in a condo overlooking the beach. We played games, cooked meals, walked on the beach, visited the Oregon Coast Aquarium, and explored sand dunes. The weather was gorgeous as well. In April I received a scholarship to head up to a one blogging conference in Seattle. Never one to turn down a fun opportunity, I invited a friend to meet me up there the day before the conference, and we broke out our tourist hats and road the Ferris wheel, took selfies at the gum wall, and checked out a few fun eating establishments. Need I say more? Other than I saw the legendary singer not once, but TWICE in one week! I had never seen him perform before and I was more certainly not disappointed. I would go see that man in concert again any day. In our small town, big things don’t happen very often, so when you hear a circus is coming to town all the kids get excited. One of the things that made this so special was the face that it was literally right in our back yard; held in the field behind the grade school which is just a soccer field away from our house. The old fashioned show was entertaining and made for a really fun family evening. Turning 30 had been on my mind for a year, so I was mentally prepared when it rolled around last June. First I had a wonderful date with my husband and he bought me a beautiful new purse and took me to one of my favorite restaurants, and then the next weekend had a fabulous surprise overnight trip to the casino on the beach with all of my best friends. I couldn’t have asked for more. This year Anika raised her lamb again, and while I never got around to writing about it on here, this time it was certainly another memorable week at the fair. She did amazing and got one of the highest prices per pound at the auction. It was also one of the hottest summers we’ve had with every day being approximately 103 degrees. It also must have been my summer for country concerts because I met up with my friends and we all (my entire family included) went and saw Joe Nichols at the county fair. We had a blast and was able to go right up front to the stage while he performed, and my two daughters caught a little bit of country fever that night. They even brought home his guitar pick as a souvenir. One of the most unique things that I did all year was head down to one of my favorite vineyards with Wayne and a couple of friends to see a Shakespearean performance. We brought our own cheese and cracker picnics and purchased a couple bottles of Stoller Family Estate Pinot Noir Rose, which was just perfect for sipping on during a breathtaking summer night. Sometimes things can happen at the last minute and you just have to go for it. I had applied for a scholarship to the Wine Blogger’s Conference months prior and had been placed on a wait list. About two weeks before the conference was held in August I received an email asking me if I was still interested in attending. After I got done screaming for joy (literally, I think I screamed out loud) I quickly rearranged plans so that I could travel to Corning, NY. I wrote in detail about the four days I spent in the Finger Lakes area, starting with my first post HERE. This was special to me because I felt proud being able to give my daughter something that even five years ago I don’t know if I would have been able to pull off. While Anika and Noah have been content with sports and other things, I knew Emma needed something a little different, so last summer I researched and found a horse camp that was less than a 30 minute drive from our house and she fell in love. She goes almost weekly now for a lesson and it amazes me on how much she’s learned over the past few months. One of my fellow bloggers and friend Marlynn had extra tickets to a Thorns game and offered them to me, so I took Anika and our friend and her son to see the game for his birthday present. They didn’t win, but we had awesome seats and the kids had a blast. For the past five years I have been holding on to my last of everything; last baby in a stroller, last preschooler, and now last 5 year old and Kindergartner. To top it off Oregon passed a law that all Kindergarten was to be full day in public schools, so there was no easing the last year here – he started full day school this September with his big sisters, but he was ready. He loves it, and as for me….I’m adjusting. We seem to get pretty lucky when we head to the beach. It’s only about an hour from us yet we don’t go out more than a handful of times a year. We stayed in August for a weekend, and one last time in November, where we ‘Glamped’ at the KOA and happened to see Sea Otters hanging out in the ocean. Another last minute decision happened and I found myself in Burbank for the weekend at a blogging conference, during which I took a quick walk on Hollywood BLVD, saw the Dancing With The Stars Pilot being filmed on the BLVD at night, and was able to squeeze in a taping of the new Netflix show “Fuller House”. I’m pretty darn excited for those to be released. I think this year must be the year of quick decisions, because that is again what happened when my friend asked me if I’d like to tag along with some co-workers to take a resident at our facility up to see a Blazer game. She was 93, a huge fan, and had never seen a live game before. I had about a day and a half’s notice but of course I said yes…and what happened next truly amazed me. But let’s just say how many people can witness a lifelong fan meet her favorite NBA player court-side??? And then be interviewed by the local news after. Read the whole story HERE. As I look back I think that this was most certainly a year of opportunity and risks. In many instances I could have said no, could have talked myself out of something because the timing wasn’t right or it took extra work to make it happen, but you know what? If I would have done that I wouldn’t have these amazing memories to reflect back on today. I hope that you have a magical night tonight and are surrounded by loved ones when the clock strikes 12. If there is one piece of advice I could give you for 2016 it’s this: just start saying yes more; say yes to new things and new opportunities. Thanks for sticking around for the past 3 years – I’m excited to share all of the great things I have in store on here as this little online space begins it’s 4th year this spring. For SURE you had an amazing year!!! What fun events Melissa 🙂 No wonder it flew by so fast!!! Shakespeare and wine, that sounds oddly perfect! Sounds like a fabulous year. What an AMAZING year, Melissa! Love, love, love the photos you shared here to capture the spirit of the year. You have such a lovely family and I am so glad we've become friends through blogging! Here's to another great year ahead for you and your sweet family! Cheers! What a fun year in review! I LOVED horse camp as a kid, those were the best memories. 🙂 Cheers! It's a wonderful year you've had, Melissa! I did 4-H with my kids (sheep, rabbits, and horses) and the experiences they gained there continue to have a profound impact on them long after. (Our "horse girl," now in college, even makes extra money exercising horses.) What a gift you are giving your kiddos! What a lovely look back at your year!